Actor/Director Dennis Hopper is also an accomplished painter and photographer. His work has been exhibited at galleries throughout the world. Dennis Hopper's work includes portraits of 1960s personalities from the art, film and music circles that he belonged to, including such well known names as Andy Warhol, Ike and Tina Turner, and Paul Newman. 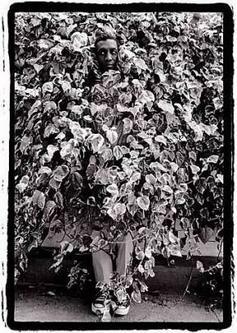 My personal favorite is the image posted here, a 1962 photograph of a very young Bill Cosby, hiding in an ivy plant with just his head and feet showing. Dennis Hopper is also said to have one of the most extensive private collections of modern art in the United States. On March 24, 2007 The Museum Associates Council of the Palm Springs Art Museum will honor Dennis Hopper along with architect/designer Frank Gehry, and artist Ed Ruscha at the Artists and Legends Gala. Fellow artist and actor Dean Stockwell will present the Stacey & Greg Renker Award of Artistic Excellence to Mr. Hopper. Visit the Pop Life Art homepage for links to art by Dennis Hopper, Dean Stockwell, and other celebrities. Bucharest Nights by Dennis Hopper at Amazon.com. Dennis Hopper: Paintings, Photographs, Films by Rudi Fuchs and Jan-Hein Sassen at Amazon.com.